A Dietary Supplement. Filtered (For consumer safety, aloin content is filtered to less than 1 ppm.). Enhanced with polysaccharide-rich Aloesorb. Aloe content and purity in this product certified - International Aloe Science Council. Retaining the quality that nature created. The aloe vera plant contains over 200 biologically active components. For over 40 years, Lily of the Desert has been the leader through its technology and innovation of providing the most efficacious aloe vera on the market. We are the largest grower and processor of aloe vera. Lily of the Desert Aloe Vera Benefits: Helps support a healthy digestive system; Helps restore and promote regularity; Helps promote normal muscle and joint function. Aloesorb: Naturally occurring isolated high molecular weight aloe vera polysaccharides that are added to regular aloe vera through a patented process. It has been clinically demonstrated to improve the efficacy and the health benefits of aloe vera. Recent clinical studies of Lily of the Desert Brand with Aloesorb: Improved absorption; Increased immune support; Enhanced antioxidant support; Reduction of nitrate levels. Important Consumer Notice: This product is a natural product; therefore the color may change slightly due to seasonal variations without effecting purity, efficacy or quality. Contains 99% organic ingredients. (These statements have not been evaluated by the Food and Drug Administration. This product is not intended to diagnose, treat, cure or prevent any disease.) For more information, please visit us at www. lilyofthedesert.com. The aloe vera plant contains over 200 biologically active components. For over 40 years Lily of the Desert has been the leader through its technology and innovation of providing the most efficacious aloe vera on the market. We are the largest grower and processor of aloe vera. Drink 2 to 8 ounces per day as a refreshing beverage. Refrigerate after opening. Lily of the Desert has been leading producer of Aloe Vera since 1971. Our Whole Leaf juice and gel products are made with Certified Organic Leaves which are grown in the fertile Rio Grande Valley of Texas. As the largest Certified Organic Grower Processor and Distributor of Aloe Vera products we work hard to provide our customers with the Puest aloe in the marketplace. By maintaining control of the total process Lily management can ensure that its products meet or exceed the highest industry standards. Free Of Additives. Disclaimer These statements have not been evaluated by the FDA. These products are not intended to diagnose treat cure or prevent any disease. Drink one ounce per day as a refreshing nutritious drink. Lily Of The Desert Organic Aloe Vera Juice Whole Leaf Concentrate is USDA certified organic and free of preservatives. The concentrate is a great option for those that want to take a small dose of aloe once a day. Their aloe vera juices contain over 200 biologically-active components including polysaccharides, essential amino acids, vitamins, minerals, and enzymes that help keep your body healthy! Lily of the Desert Aloe Vera Juice Whole Leaf Description: Now Enhanced with Polysaccharide-Rich AloesorbCertified Organic- Preservative FreeGreat Tasting! Lily of the Desert has been leading producer of Aloe Vera since 1971. Our Whole Leaf juice and gel products are made with Certified Organic Leaves which are grown in the fertile Rio Grande Valley of Texas. As the largest Certified Organic Grower, Processor and Distributor of Aloe Vera products, we work hard to provide our customers with the purest aloe in the marketplace. By maintaining control of the total process, Lily management can ensure that its products meet or exceed the highest industry standards. Aloesorb- a new delivery system rich in naturally occuring aloe polysaccharides that is clinically shown to enhance the bioavailability of vitamins and herbs by infusing additional higher molecular weight aloe polysaccharides. Lily of the Desert Aloe Vera Benefits: - Contains valuable aloe polysaccharides- Helps restore and promote regularity- Helps support a healthy digestive system- Helps maintain stomach pH balance- Helps support normal muscle and joint function- Increases absorption of other supplements when taken with Aloe Vera Juice- Certified for Purity and Content by the IASC Disclaimer These statements have not been evaluated by the FDA. These products are not intended to diagnose, treat, cure, or prevent any disease. Lily of the Desert Aloe Vera Juice Whole Leaf Concentrate Description: Natural Aloe- 5 Times Strength Certified Organic-No Preservatives Lily of the Desert has been leading producer of Aloe Vera since 1971. Our Whole Leaf juice and gel products are made with Certified Organic Leaves which are grown in the fertile Rio Grande Valley of Texas. As the largest Certified Organic Grower, Processor and Distributor of Aloe Vera products, we work hard to provide our customers with the purest aloe in the marketplace. By maintaining control of the total process, Lily management can ensure that its products meet or exceed the highest industry standards. Lily of the Desert Aloe Vera Benefits: - Contains 46% more Aloe Polysaccharides than other leading brands and the highest molecular weight- No additives (Sugars, Starches or Water)- IASC Certified- State of the Art Technology and Process Free Of Additives. Disclaimer These statements have not been evaluated by the FDA. These products are not intended to diagnose, treat, cure, or prevent any disease. Drink 2 ounces per serving as needed. *Daily value not established. Other Ingredients: Carrageenan (thickening agent) citric acid (pH stabilizer) potassium sorbate (mold inhibitor) Warnings Refrigerate after opening. Lily of the Desert has been a leading producer of Aloe Vera since 1971. Our juice and gel products are made with Certified Organic leaves. As the largest Certified Organic Grower Processor and Distributor of Aloe Vera products we work hard to provide our customers with the purest aloe in the marketplace. Our market leading innovation and patented processes allow us to offer the best possible products to our customers. Drink to your health! Our Aloe Vera gels contain the same 200 biologically-active components as our juices, but have a thicker consistency than the juice. Some consumers find this thicker consistency to have a ?soothing? effect. The juices and gels have the same beneficial polysaccharides, essential amino acids, vitamins, minerals and enzymes. Just pick a consistency that you like best! Health Benefits: Support Healthy Digestion. Support a healthy immune system. Reduce harmful toxins. Increase absorption of nutrients. Enhance antioxidant support. Balance stomach acidity naturally. Soothe occasional muscle and joint discomfort. Lily of the Desert Aloe Vera Gel Inner Fillet Description: Made with Certified Organic Aloe Vera Leaves/Juices Now Enhanced with Polysaccharide-Rich Aloesorb Aloe Content and Purity In This Product Certified by the International Aloe Science Council Welcome to the Lily TraditionLily of the Desert has been a leading producer of Aloe Vera since 1971. Our juice and gel products are made with Certified Organic leaves. As the largest Certified Organic Grower, Processor and Distributor of Aloe Vera products, we work hard to provide our customers with the purest aloe in the marketplace. Our market leading innovation and patented processes allow us to offer the best possible products to our customers. ALOESORB - a new delivery system rich in naturally occurring aloe polysaccharides that is clinically shown to enhance the bio-availability of vitamins and herbs by infusing additional higher molecular weight aloe polysaccharides. Lily of the Desert Aloe Vera Benefits: Contains a full range of valuable aloe polysaccharides Clinically proven to increase absorption of other supplements when taken with aloe vera juice Helps restore and promote regularity Helps support a healthy digestive system Helps maintain stomach pH balance Helps support normal muscle and joint function Certified for Purity and Content by IASC Disclaimer These statements have not been evaluated by the FDA. These products are not intended to diagnose, treat, cure, or prevent any disease. Inner FilletLily of the Desert fillet aloe vera products meet National Organic standards, and are made with 100% Certified Organic aloe vera leaves. Recent studies show that taking supplements with aloe vera will increase the absorption of these supplements by up to 200% versus taking them with water.This product is a natural product; therefore the color may change slightly due to seasonal variations without effecting purity, efficacy, or quality.32 OuncesIngredients:99.7% Certified organic aloe vera, purified water, less than 1% of the following natural sources: citric acid (oxidation inhibitor), potassium sorbate (mold inhibitor). - Concentrated to save you money. This bottle provides 32 servings. - Our conentrated Aloe Gel delivers a minimun of 10% natural aloe polysaccharides by weight. No polysaccharide extracts are added to this formula. - ALOE VERA 80DETOXIFYING FORMULA* used specially processed Aloe Vera to ensure the maximum health benefits possible. - Each leaf is hand-filleted to ensure that only the pure fresh gel is usedwith no aloin. As a dietary supplement mix one capful (1 fl. oz.) of Aloe Vera80 Detoxifying formula concentrate with 2 fl. oz. of water or your favorite beverage. Enjoy one to three times daily. Lily of the Desert aloe vera gelly soothes and moisturizes wind and sun burned skin. Also effective for minor cuts and burns bites chaffing rash and skin irritations. Free Of Parabens artifical colors synthetic fragrance and animal testing. Organic aloe vera barbadensis juice (gel) lactobacillus/arundinaria gigantea extract (bamboo) gluscose (perservative) carboner (thickner) aloe barbadensis leaf polysaccharides (certified organic aloesorb™) tocopheryl acetate (vitamin E) retinyl palmitate (vitamin A) ascorbic acid (vitamin C) phenoxyethanol (perservative) glucose oxidase (and) lactoperoxidase (perservative) and sodium hydroxide (ph adjuster). Apply to skin repeat as necessary. Aloe Vera is a natural plant therefore the color may change due to seasonal variations without effecting purity efficacy or quality. Additives (sugar water starches). Disclaimer These statements have not been evaluated by the FDA. These products are not intended to diagnose treat cure or prevent any disease. Drink 1-8 ounces per day as a refreshing nutritious drink. - Contains 46% more Aloe Polysaccharides than other leading brands and highest molecular weight polysaccharide ever studied. Lily of the Deserts Aloe Vera Gelly soothes and moisturizes wind and sun burned skin. Also effective for minor cuts and burns bites chaffing rash and skin irritations. Free Of Parabens artificial colors synthetic fragrances animal testing. Disclaimer These statements have not been evaluated by the FDA. These products are not intended to diagnose treat cure or prevent any disease. Ingredients: Certified Organic Aloe Vera Barbadensis Juice (Gel) Lactobacillus/Arundinaria Gigantea Extract (Bamboo) Glucose (Preservative) Carbomer (Thickener) Aloe Barbadensis Leaf Polysaccharides (Certified Organic Aloesorb) Tocopheryl Acetate (Vitamin E) Retinyl Palmitate (Vitamin A) Ascorbic Acid (Vitamin C) Phenoxyethanol (Preservative) Glucose Oxidase (and) Lactoperoxidase (Preservative) Sodium Hydroxide (pH Adjuster). Aloe Vera Juice, Lemon Lime - Lily of the Desert has been the leading producer of Aloe Vera products since 1971. Organic aloe vera leaves from the fertile Rio Grande Valley of Texas are grown in accord with strict standards established by the Texas Department of Agriculture to meet organically grown certification. The Lily of the Desert method for growing, harvesting, processing and manufacturing assures our customers all products with the highest levels of efficacy by retaining the valuable nutrients contained in our organic aloe vera plants: these include polysaccharides, vitamins, minerals, enzymes and amino acids. We use a cold processing method to effectively remove the aloin, the harmful bitter constituents contained in aloe vera. Lily aloe is non-pasteurized to provide our customers with a quality product as close to natures own original aloe vera leaf as possible. The Aloe Vera is organically produced and processed to Texas Organic Standards & Cert. Reg. Refreshing; Thirst Quencher, Nutritious Health Beverage. Aloe Vera is organically grown and processed in accordance with the California Organic Foods Act 1990. Aloe Vera (Aloe Barbadensis-Officinalis) has been traditionally used for antibacterial, antifungal activity, antiviral effects, immune enhancement, wound healing, diabetes, anti-inflammatory properties, constipation and for the female reproductive system. Lily of the Desert Aloe Vera 80 Detoxifying Formula Description: Concentrated Aloe Vera Gel Dietary Supplement with Pure Aloe Pulp and Natural Herb Blend 3 Times Strength CLEANSES and DETOXIFIES NATURALLY*A special supplement combining the benefits of bioactive aloe vera gel with the cleansing detoxifying properties of naural herbs. Aloe Vera Gel, ground to maintian the natural fiber, is also added for additinal health benefits*ALOE VERA 80 QUALITY - Concentrated to save you money. This bottle provides 32 servings- Our conentrated Aloe Gel delivers a minimun of 10% natural aloe polysaccharides by weight. No polysaccharide extracts are added to this formula- ALOE VERA 80DETOXIFYING FORMULA* used specially processed Aloe Vera to ensure the maximum health benefits possible- Each leaf is 'hand-filleted' to ensure that only the pure, fresh gel is used, with no aloin. Disclaimer These statements have not been evaluated by the FDA. These products are not intended to diagnose, treat, cure, or prevent any disease. 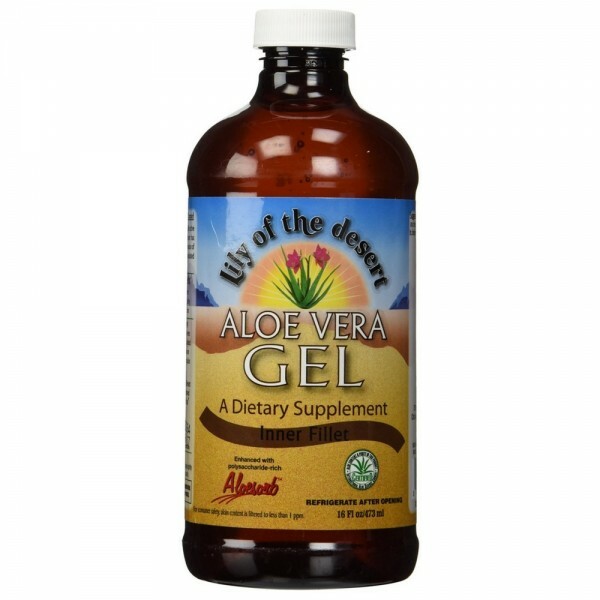 Lily of the Desert Aloe Vera 80 Stomach Formula Description: 3 Times Strength Concentrated Aloe Vera Gel Dietary Supplement With FOS and Natural Herbal Blend Handle Stomach Stress Naturally! We lead high pressure lives and our stomachs pay the price. Aloe Vera 80 Stomach Formula is the ultimate stomach friendly drink - it coats, stimulates the growth of healthy bacteria in the intestinal tract and helps maintain normal acid levels. Aloe Vera 80 Stomach Formula is an all-natural supplement that combines bioactive Aloe Vera standardized to guaranteed 10% polysaccharides with FOS to make stomach stress a problem of the past. Aloe Vera 80 Quality- Concentrated to SAVE YOU MONEY. This bottle provides 32 servings- This Concentrated Aloe Gel delivers a minimum of 10% natural aloe polysaccharides by weight. No polysaccharide extracts are added to this formula- ALOE VERA 80 STOMACH FORMULA uses specially processed Aloe Vera to ensure the maximum health benefits possible- Each leaf is "hand-filleted" to ensure that only the pure, fresh gel is used, with no aloin. Disclaimer These statements have not been evaluated by the FDA. These products are not intended to diagnose, treat, cure, or prevent any disease. Lily of the Desert Aloe Vera Juice Orange Papaya Description: Refreshing Flavor Nutritious and Satisfying Lily of the Desert has been leading producer of Aloe Vera since 1971. Our Whole Leaf juice and gel products are made with Certified Organic Leaves which are grown in the fertile Rio Grande Valley of Texas. As the largest Certified Organic Grower, Processor and Distributor of Aloe Vera products, we work hard to provide our customers with the purest aloe in the marketplace. By maintaining control of the total process, Lily management can ensure that its products meet or exceed the highest industry standards. - Great Tasting Flavor- Full Strength 1:1 Formula- Made with Certified Organic Aloe Vera Leaves and pulp- No additives (Sugars, starches or water)- State of the Art Technology and Process- Contains 46% more Aloe Polysaccharides than other leading brands and highest molecular weight polysaccharide ever studied. Free Of (Aloe Vera Juice Orange Papaya-Nutrition Facts fro 2oz. ): Additives (sugar, water, starches). (Aloe Vera Juice Orange Papaya-Nutrition Facts for-8oz. ): Additives (sugar, water, starches). Disclaimer These statements have not been evaluated by the FDA. These products are not intended to diagnose, treat, cure, or prevent any disease. 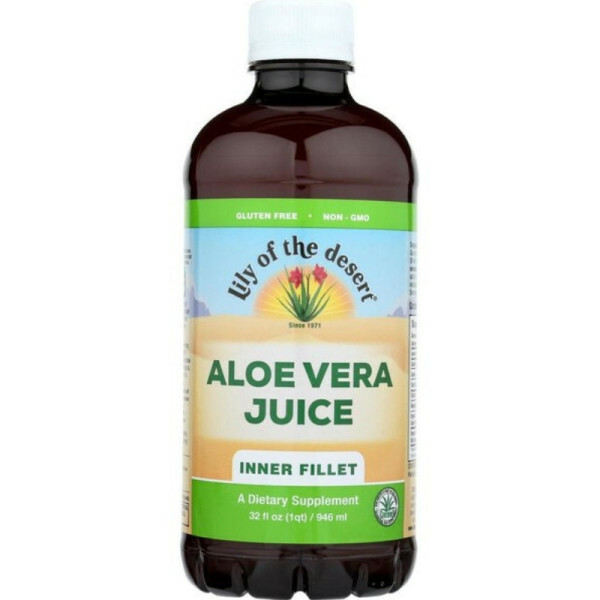 Lily of the Desert Aloe Vera Juice Inner Fillet Description: Made with Certified Organic Aloe Vera Leaves Enhanced with Polysaccharide-Rich Aloesorb Retaining the Quality that Nature Created The aloe vera plant contains over 200 biologically active components. For over 40 years, Lily of the Desert has been the leader through its technology and innovation of providing the most efficacious aloe vera on the market. Lily of the Desert is the largest grower and processor of aloe vera. Lily of the Desert Aloe Vera Benefits Helps Support a Healthy Digestive System Helps Restore and Promote Regularity Helps Promote Normal Muscle and Joint Function Aloesorb Naturally occurring isolated high molecular weight aloe vera polysaccharides that are added to regular ale vera through a patented process. It has been clinically demonstrated to improve the efficacy and the health benefits of aloe vera. Recent Clinical Studies of Lily of the Desert Brand with Aloesorb Improved Absorption Increased Immune Support Enhanced Antioxidant Support Reduction of Nitrate Levels Disclaimer These statements have not been evaluated by the FDA. These products are not intended to diagnose, treat, cure, or prevent any disease.